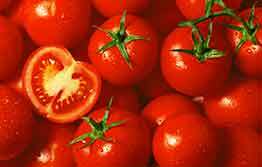 Tomato potato psyllid (TPP) is a significant production pest for a range of plants including potato, tomato, eggplant, capsicum, chilli, tamarillo, sweet potato, mint and goji berry. It is now established in and around Perth in Western Australia. If you think you have seen the tomato potato psyllid anywhere else in Australia, call 1800 084 881. The psyllid is a tiny sap-sucking insect. Tomato potato psyllids go through three stages of development – egg, nymph and adult. Adults and nymphs cause injury to plants by feeding with sucking mouth parts. Adult psyllids resemble a winged aphid and are about 3mm long. The body is brownish and has white or yellowish markings on the thorax and a broad white band on the abdomen. Wings are transparent and rest roof-like over the body. Nymphs are up to 2mm long, oval shaped, flattened and scale-like in appearance. Young nymphs are yellow with a pair of red eyes and three pairs of short legs. Older nymphs are greenish and fringed with hairs and have visible wing buds. 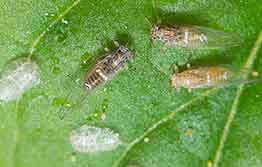 Psyllid eggs are less than 1mm long and are attached to the plant by a short vertical stalk. They are usually laid on the lower surface of leaves or as a halo around the leaf edge. Eggs are white when first laid then turn yellow to orange after a few hours. In addition to the list of plants above, TPP may also be carried by other plant material including nursery plants, leafy vegetables and cut flowers. A recent outbreak of TPP in Western Australia has meant that biosecurity agencies in other Australian states and territories have introduced import restrictions on TPP host and carrier material. If you are travelling from WA and intend to move plant material, please check the website of your destination state or territory to determine if the plants pose TPP risk.